Happy Bake Shop Square Day! Aka Friday, but where’s the fun in that? Today I’ve got waffles fresh out of the toaster *I mean* waffle-maker for ya! Hot with buttah… gosh do I love butter. Anyway – here is the magical, oh so delicious waffle! Don’t ya love how the granny square stitches shape this guy to look like those toaster cinnamon waffles? Ya know, the ones that for some reason are square-ish shaped and are begging to be torn in four pieces? Anybody? Bueller? This little guy screams of breakfast-y happiness and I hope you enjoy him as much as I have! Note: You will need to know how to crochet the waffle stitch for this pattern. If you are unfamiliar, fret not! The video tutorial below will go over just what you need to know step by step for this exact project! -Worsted weight yarn in toffee, a small amount of mustard, and an accent color (I chose mint) – I used Lion Brand Vanna’s Choice for all of these! 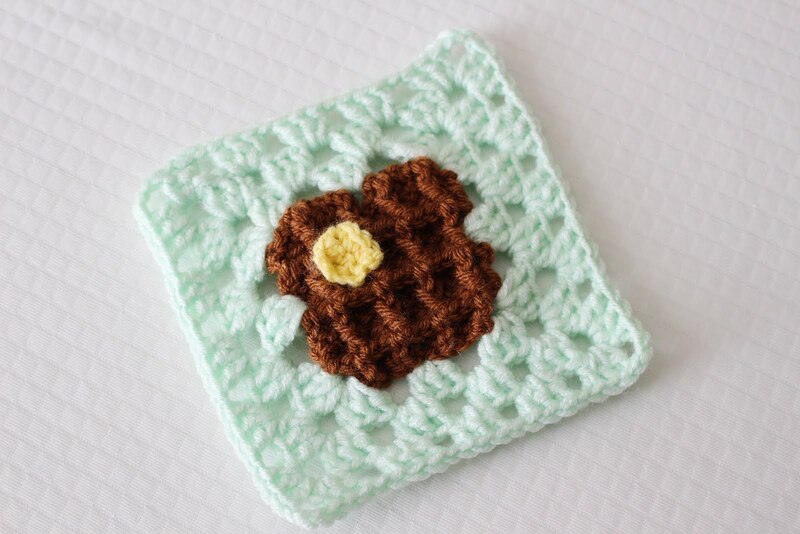 And that’s it for the waffle granny square! I could see this being the beginning of a breakfast blanket series…. You’ll just have to be sure to keep up with me to find out!Thanks for checking out this installment of the Bake Shop Blanket Series! Click HERE to see the whole project finished and get all the other squares!